I am a huge fan of cotton linens for the kitchen. Good traditional cotton. Not some odd ball cotton-poly-plastic blend. That does nothing but repeals water. I want real cotton! I have shown off the bed linens advertisement for Morgan Jones before... with their wonderful hob nob and chenille bedspreads. Which were just top notch quality. So many of those bedspreads are still very actively found for sale, on eBay. And practically any antique mall. 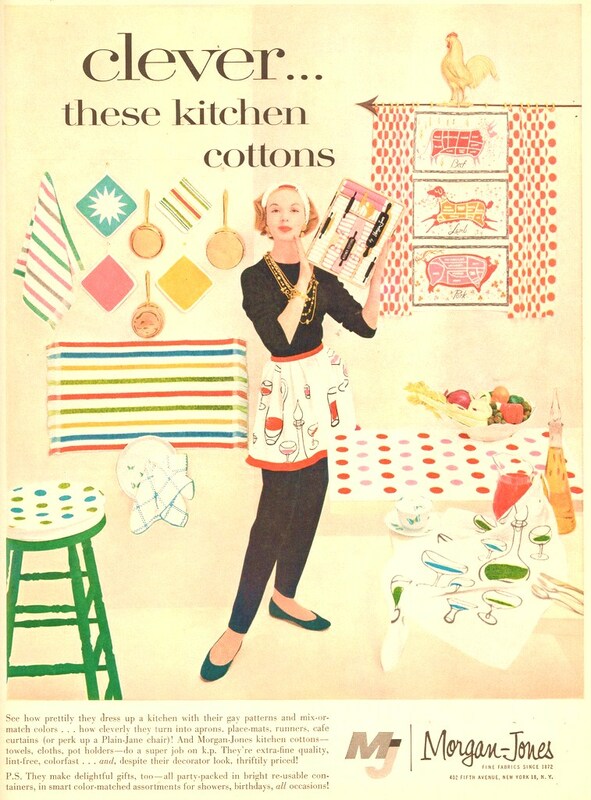 Sadly, most of the kitchen cotton items... never made it that far. They can only take so many trips through the washer. Yet, I do see odd things, like wall hangings every so often still in decent shape. Or those old linen wall calendars. Labels: Morgan Jones kitchen linens.